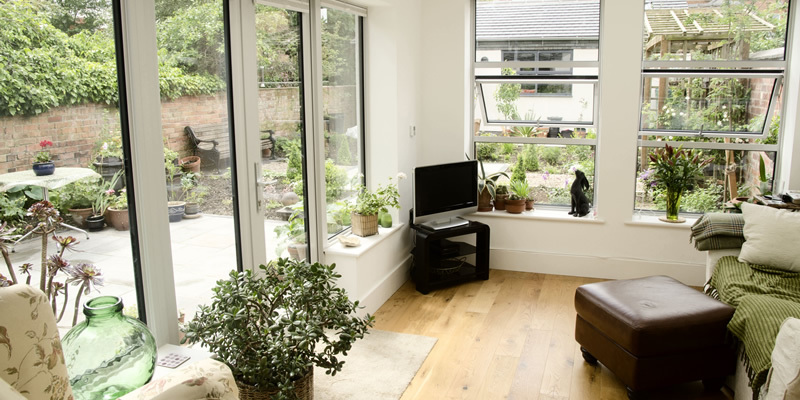 The clients wanted a new dwelling in the garden of their Victorian house and to downsize into a more energy efficient building that would need less maintenance, with easy access for people with limited mobility. Their existing period property was uninsulated, had single glazed sash windows, open fires and required a lot of maintenance. Even before the design work was started, the clients confirmed that a well insulated, air tight construction was essential, to reduce running cost to a minimum. 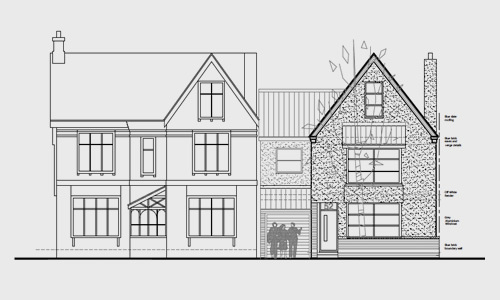 Pre-application enquiries with the Planning Department confirmed that the site was considered suitable for residential development, subject to a flood risk assessment. Although a more contemporary design was considered acceptable, the massing was to be sympathetic to the clients original house and the adjacent neighbours property. Both the planning officer and the clients were keen to retain the Acer tree on the front boundary. Because it was a double plot the existing site could be split into two, keeping the drive and garage within the boundary of the Victorian property. The resulting building plot has an 8.9m frontage and a depth of 40m front to back. The main body of the new building is to the front of the site with a single storey block to the rear, in keeping with the neighbouring properties. The clients also required a workshop and potting shed space in the rear garden. As the existing buildings either side were quite large, a matching ridge height and pitch provided additional space for rooms in the roof, where attic trusses were used for ease of construction. The bay window is a design element that was a feature that the clients enjoyed in their previous home, but also helps the new building to relate to the existing street scene. Although extensive flood defences have now been constructed around the River Trent in Nottingham, the site was still deemed to be at risk of flooding by the Environment Agency, who required a flood risk assessment as part of the planning application. This had to include a ‘sequential test’ which considered whether other possible sites in the area would be more appropriate for development. The ground floor level has been raised above the predicted 1:100 year flood level, and resilient materials were used in the construction. Non-return valves were fitted in the drains, and the air bricks designed to be closed in the event of a flood. All the affected neighbours were shown the proposed design before it was formally submitted, and no objections were received by the planning department. The application was approved within the usual eight week timescale. Detailed drawings and specifications were produced for Building Regulations approval and the issue of tenders to contractors. It is essential to make sure that the fabric of the building is energy efficient before turning to technological solutions, so high levels of insulation were specified to the walls, floor and roof. High performance aluminium windows were chosen, and a mechanical ventilation and heat recovery system has been installed. This avoids the need for trickle vents in the windows or extract fans in the kitchen and bathrooms, and reduces heat loss from the house by reclaiming heat before stale air is vented out of the building. A vertical service duct was built into the house so that the ductwork from the equipment in the roof space could easily be run to all the ceiling voids. Open web engineered floor joists allow the horizontal ducts to be concealed. The ventilation system extracts air from the kitchen, utility, and bathrooms and feeds in preheated fresh air to the bedrooms, sun lounge, sitting room and hallway. 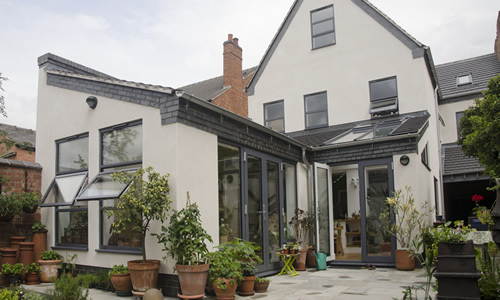 Because the air-tightness limits heat lost from the house, it reduces input required from the ground source heat pump. 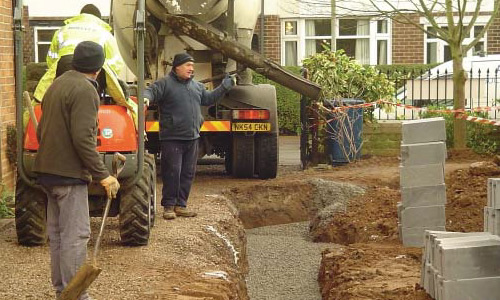 A study of the ground conditions was undertaken to establish the suitability for a ground source heat pump. Because there was limited space, vertical boreholes were chosen rather than shallow trenches. Although a high water table made drilling the boreholes difficult, now they are in place, the wet ground conducts heat much more efficiently than dry. The heating demand of the house was calculated and the site geology suggested that two 85m deep boreholes were required to provide suffi cient output. Although initially expensive, the heat pump qualifies for a £1,500 renewable heat incentive (RHI) payment from the government plus an £800 annual grant towards the running costs. The Worcester Bosch heat pump has an integrated hot water cylinder, that can be used as an immersion heater if larger than usual volumes of hot water are required. The unit is the size of an upright fridge freezer and quite noisy, so a large, sturdy cupboard has been built around it. The heat pump is linked to the wet underfloor heating system which operates at a lower temperature than ordinary radiators, making it more efficient to run. The roof is south facing, onto which a 4kW PV panel array has been installed. This free electricity from the PV panels is used to run the heat pump – a perfect combination. The running costs are virtually zero, so the government grant for power generated by the panels is effectively an income. Although this ‘feed-in tariff’ grant has reduced from a 42p per unit high point of a few years ago, the installation still receives 22p per unit which should give the client a 10% return on their investment. The property does not have mains gas, so a ceramic induction hob and electric oven have been fi tted to the kitchen. To store heat and reduce internal temperature variations, concrete blockwork walls, concrete floor screeds and plaster have all been used to store heat within the building fabric. The wet-applied plaster also helps to improve air tightness, further reducing heat loss due to draughts. 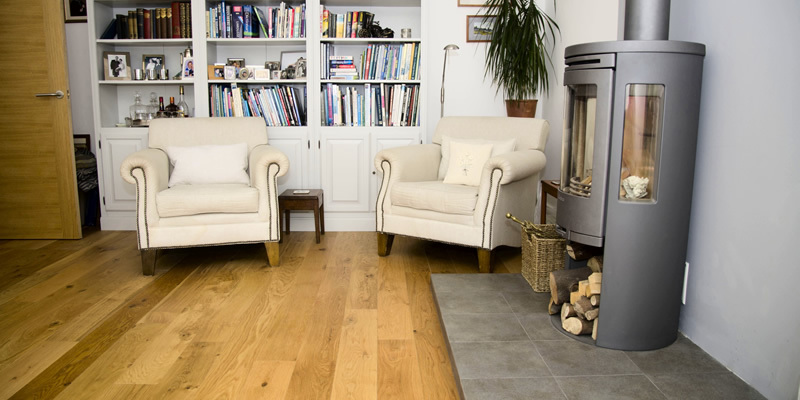 The clients have chosen a log burning stove as a focal point in the Living Room, but is rarely needed for heating. As underfl oor heating is much slower to respond than radiators, the stove gives the option of a quick additional heat source if required. As all new houses in the UK have to fitted with water meters and the clients are keen gardeners, a 6,500 litre rainwater harvesting tank was buried in the rear garden. This collects rainwater from the roofs of the house and workshop for reuse flushing toilets, for the washing machine and for the outdoor taps.